I’ve been hanging on this post for seven days now and only two of my tabs have been taken. In the morning two days ago, I thought a man was finally going to take another tab but instead I found him hanging what would become my enemy. I become very angry very quickly since this man put his ad oh so ever slightly over top of me. I couldn’t believe that this man had the audacity to think he could use the same post as I am on. Didn’t he see me standing my ground and claiming this post? How dare he post his disgusting ad right above me and thinking by putting English on his ad thinking that his ad could out do me. So what if he has a two bedroom apartment and I only have one. Fine. I accept this challenge. I will out due his ad and have more tabs taken. I’m trying to look on the bright side here but nope, can’t find one. I’m pissed. I feel as if I’m chopped liver now as the Ad above gets glanced at more by people walking down the street. I need more tabs taken so my owner can be happy again. 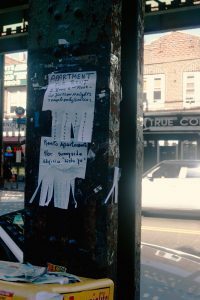 I have more motivation to sell this address that I’m displaying then the ad above with the thick tabs his owner gave him. My enemy thinks his is better than me just because this address says it’s a two bedroom apartment…. SIZE DOESN’T MATTER I WAS TOLD! How dare he mock me by saying he is above me physically and mentally. I’ll show him! Just watch me sell my address first and be taken down off this rusty cold post wayyyyy before him. I don’t think he knows who is he messing with! Just wait I’ll do way better then him.